Dr. Debbie G. Senesky is an Assistant Professor in the Aeronautics and Astronautics Department at Stanford University. She received her B.S. in Mechanical Engineering from the University of Southern California. Debbie was next awarded her M.S. and PhD in Mechanical Engineering from the University of California, Berkeley. Before joining the faculty at Stanford, Debbie held positions at GE Sensing, the Berkeley Sensor and Actuator Center, GE Global Research Center, Hewlett Packard, and Delphi Automotive Systems. In recognition for her excellence in research, Debbie has received many awards and honors, including an Alfred P. Sloan Foundation Ph.D. Fellowship, a Galiban Faculty Fellowship at Stanford University, the Frederick E. Terman Faculty Fellowship at Stanford University, and the Space Technology Early Faculty Award from NASA. Debbie is with us today to tell us about her life and science. When Debbie isn’t working in the lab, you can find her hanging out with her husband, her three year old daughter, and the family dog. Lately, they have been enjoying going swimming together since her daughter has gotten into swimming. 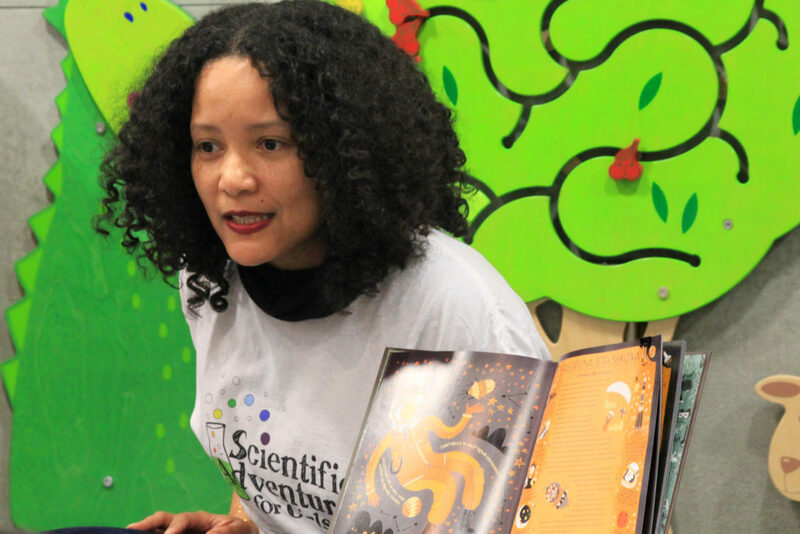 Debbie also enjoys volunteering for the non-profit organization Scientific Adventures for Girls. This program engages elementary school students in activities to get them excited about STEM fields. At work, Debbie is dedicated to creating materials that are tiny and tough enough to operate in extreme environments like outer space. They also study the impacts of space-like conditions on these materials. In particular, they leverage the properties of a class of nanomaterials called wide band gap semiconductors. The ceramic properties of these materials make them resistant to extreme temperature, chemical, and radiation environments, and Debbie’s research group fabricates these materials into small sensors and other devices. It is important to make these things tiny because transporting things into space is really expensive, and it is critical to make them tough because the conditions in space are incredibly harsh. In elementary and high school, Debbie excelled in math, science, and art. She was the first in her family to go to college, so it was a challenge to navigate the application process and choose a major on her own. At the time, Debbie didn’t even know what engineering was. While leafing through a book of careers at the library, she came across civil engineering. It seemed to combine all of her interests in math, science, art, and architecture, so she decided to pursue engineering in college. During college, Debbie shifted her focus to mechanical engineering, and she had a phenomenal experience working on a summer project in a laboratory at the University of California, Berkeley. This convinced her to pursue her PhD there. Towards the end of Debbie’s postdoctoral fellowship, she applied for several academic faculty jobs. She went on a few interviews and received positive feedback, but was ultimately not offered a position. After this failure, Debbie was discouraged and wasn’t sure if she was going to attempt another round of applications. She took the risk and put herself on the market again, this time applying for a variety of mechanical engineering and aerospace positions. The second time around, Debbie was successful, and she has been really happy in her position at Stanford. Recently, research from Debbie’s lab on their tiny and tough devices for space exploration was highlighted in the Stanford News. It was exciting to have others at Stanford interested in her work, and even more exciting to see additional articles popping up afterwards in the popular media, including an article on space.com. Debbie never imagined she would end up doing research relevant to space exploration, but it has been thrilling to have her work recognized by the space community. Debbie was able to travel to Japan for for one of the major conferences in her field, and she was delighted to bring one of her cousins along for the trip. They started in Tokyo and enjoyed shopping, dining, and exploring the city. After a ride on the Shinkansen (high-speed train), they were immersed in the beautiful city of Kyoto. Debbie had a great time meeting with her colleagues at the conference, and had a wonderful time in Kyoto. Debbie’s lab group has fun sending each other messages in their group chat throughout the day, and they have been really getting into their nature chat channel. The Stanford campus was recently overrun with caterpillars, and there were so many fantastic pictures of caterpillars posted on their chat. One of the students even found a few caterpillars crawling on her while she was sitting in class. Another great tradition that Debbie has is awarding students prizes out of her XBag (a bag of fantastic nerdy toys named after their extreme environments lab or “XLab”) when they have a big accomplishment. The lab’s favorite toy so far has been a mini robot made using a toothbrush head called a Bristlebot. Follow your passions. As you do so, you will hit walls and roadblocks. Perseverance will help you overcome these obstacles to reach your goals. Don’t be afraid to change fields or go in a different direction than you expected as you pursue your passions. Debbie’s research interests include the development of micro- and nano-scale sensors, wide bandgap electronics, and novel materials for operation within extreme harsh environments. These environments, including deep space, combustion engines, and wellbores, require unique solutions to address extreme temperature, chemical, and radiation challenges. Debbie currently serves as co-editor the for IEEE Electron Device Letters and Sensors journals. 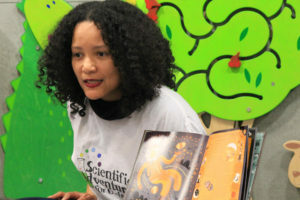 In addition, she serves on the advisory board of a non-profit called Scientific Adventures for Girls. This organization offers after-school and summer programs for kids to spark and sustain interest in STEM fields. In her spare time, Debbie enjoys spending time with her family, listening to podcasts and creating art.